There’s only 77 days until an asteroid ploughs into Earth causing an apocalypse. Hank Palace has lost his job as a police detective and is counting down the days to doomsday hanging out with his dog, Houdini, and chatting at a local diner. All around them society is crumbling in advance of the impact. To try and keep order, the US Department of Justice has invoked a police state, but regardless people have organised themselves into collectives and communes, and many have abandoned their lives in order to undertake their bucket list. When Martha Milano, Palace’s old babysitter asks him to look for her missing husband, Palace thinks that Brett Cavatone might have fled the nest. As he tries to track him down, he senses that Brett had another agenda. Finding Brett, however, is no easy task given the lack of modern amenities and Palace is forced to rely on the help of his anarchist sister who still has hope that the apocalypse can be avoided. The general consensus is that Palace should abandon his hunt and concentrate on keeping himself alive, but his sense of obligation and duty and his desire to act as a detective compel him to find Brett and bring him home to Martha. 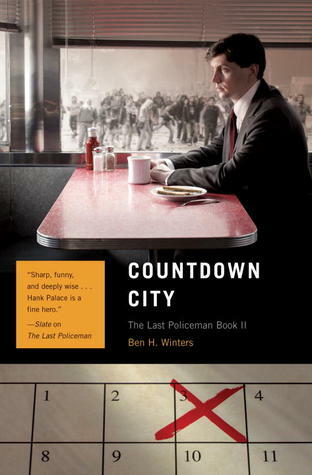 Countdown City is the second book in the Last Policeman trilogy and picks up Hank Palace’s story a couple of months after the first. The real strength of the series is the premise and the character of Hank Palace. Despite the impending doom of an asteroid hitting Earth, Palace feels compelled to continue acting like a detective and serving his fellow citizens, despite having lost his job and the woman he loved. Everyone around him might be selfishly acting out their desires or plotting how to survive the apocalypse, but Hank is determined to stay a decent, humane fellow to the end. Having such a civil lead character enables Winters to inflect the story with a series of philosophical questions concerning social relations and how people treat each other in extreme circumstances. He does so, however, subtly so that the story remains very much a crime novel rather than a reflective literary text. The plot for the most part works fine, with Palace trying to track down a wayward husband who has abandoned his wife. However, it did very much read as a bridging book to the final instalment, moving elements of the plotline and characters into place for the denouement. As such, the reader really needs to have read the first book to fully understand what is happening and has to appreciate that they will need to read the third to experience closure given the open ending of this instalment (I’m assuming the third book will provide closure). Overall, an entertaining read, but probably not best read as a standalone.